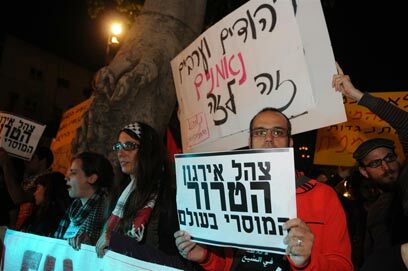 Around 100 extreme leftists are protesting near Tel Aviv's Cinematheque in a show of support for the Palestinian "Nakba Day," "the Just people's uprising", and against "the killing of innocent civilians". The protestors were carrying Palestinian flags and posters reading "Stop the civilian deaths", "Free Palestine", "the IDF is the most moral terror organization in the world", and "There is no holiness in the occupied city". The radical leftists said they were there to protest against the "killing of innocent civilians protesting against the occupation on the northern border and in the Golan Heights". Some of the female protestors even wore black headscarves to identify with the Palestinian "catastrophe". They are chanting "Barak you killer, the Intifada will be victorious". A group of right wing activists is holding a counter-protest, waving Israeli flags and calling out "Am Yisrael Chai" (the Israeli nation lives). They also called out to the radical leftists "you are a fifth column, traitors, you didn't served in the army"
Police arrived at the scene to maintain the peace after a number of vocal clashes broke out between protestors. Meanwhile, a group of enraged local residents threw eggs at the radical leftist protestors. See all talkbacks "Radical leftists: Soldiers are killers"